My wife bought this huge turnip when she went grocery shopping. Mind you, it was an impulse buy! Well, this huge root had been sitting there for a while. We invited some friends over for Diwali at the last moment. We kept the cooking simple for the potluck. I decided to try and cook the turnip. I had never eaten or cooked turnip before. I have to describe the different flavors of this lovely root. I peeled the turnip with a peeler and diced it into small cubes. When raw the turnip has a sweet flavor. I have to keep this is mind for a salad. I wanted to experiment with this dish by combining fresh rosemary and fennel seeds, two outstanding flavors that raise the bar of food taste wise when added to complementary vegetables. Then I combined these flavors with the common Indian ingredients we all are very familiar with - garlic, ginger and plain yogurt as I wanted to add a nice base to the dish. On to the recipe then. Grate the ginger and garlic and set aside. In a large frying pan on medium heat, add the oil. When the oil is starting to get hot, add the fennel seeds and stir a bit. Add the ginger, garlic and ½ tsp fresh minced rosemary leaves, and continue stirring. Now add the cayenne pepper and just as it starts to release its aroma, add the plain yogurt. Mix everything well. Turn the flame to high and keep stirring as the water from yogurt evaporates and the oil eventually starts to rise. Throw in the turnips, add salt and mix well. 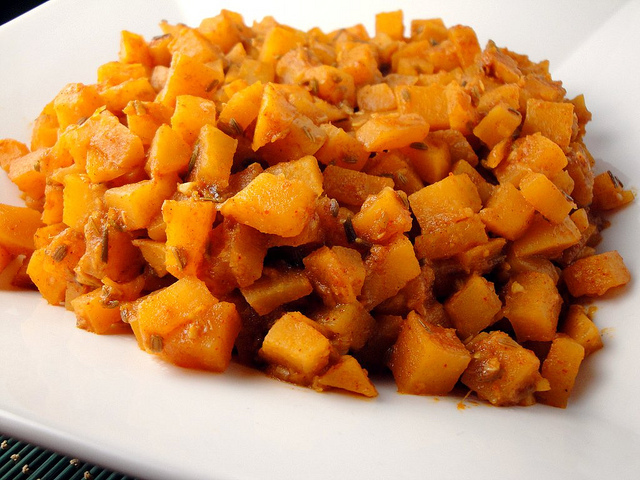 Bring the flame back to medium heat, add water in ¼ to ½ cup increments and cook the turnips. I tasted the turnips when they were slightly cooked. They tasted bitter. Interesting! When the water in the pan dries up, add some more water. Continue cooking until the turnips are cooked ,but half crunchy and half soft. At this point add the remaining water (around ¼ cup), and garnish with ½ fresh minced rosemary leaves and 1 tbsp of browned butter (ghee). Mix well and serve hot. I like the crunchy and soft texture as it goes well with rice ,and with bread or chapati. The turnip now tasted a little lemony, with a hint of sweetness and minuscule amount of bitterness, similar to white radish. Actually i liked it better the next day, when all the flavors had come together.